The QV7 is Eurogem’s recommended combined Steam with Vacuum domestic cleaning solution for homes with extensive fine carpet flooring or where occupants suffer from dust mites, asthma, eczema or other allergies/chemical intolerance. The QV7 is Eurogem’s recommended Steam with Vacuum domestic cleaning solution for homes with extensive fine carpet flooring or where occupants suffer from dust mites, asthma, eczema or other allergies/chemical intolerances. The QV7 belongs to the QV product range of which Eurogem has exclusive distribution rights within Australia and New Zealand. This quality Italian cleaner, while similar to the Home Care in boiler size, steam generation and vacuum power, has superior carpet cleaning capabilities via it’s Power Head attachment tool and Dual Filtration process. Eurogem’s steam process to clean carpets should not to be confused with the warm water injection process used by most carpet cleaning contractors. Our process leaves carpets relatively dry, not drenched as is the case with water injected cleaning. With the QV7 carpets can be kept in a pristine, sanitized, odourless and bug free condition all year round without the expense of cleaning contractors. The 240 volt motor driven Power Head is attached to the machine body with a separate light weight suction hose and extension rods. The Power Head has fast rotating beater bars for pulsating deep into the carpet pile and soft brushes to loosen and extract the smallest particles of dirt from the base of the pile. After dry vacuuming is complete, the main floor head and steam/suction hose are attached. The steam process injects large amounts of sanitizing steam deep into the carpet. Carpets stay relatively dry as the QV7 ‘s steam contains only 5% moisture. Even fine cut loop woolen carpets are completely dry within 20 minutes. Unlike traditional water-injected cleaning methods, there is no risk of water damage to carpets and there are no moldy odours. At the same time as cleaning, the killing power of steam penetrates to the base of the carpet pile destroying, dust mites, bed bugs, fleas and their eggs. The steam also deodorises common household smells such as pet and nicotine odors. 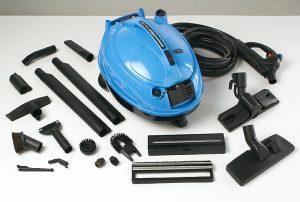 The QV7 is supplied with various spotting tools to remove liquid stains that have penetrated deep into the carpet pile. To remove stubborn stains very hot water (and a little bit of carpet shampoo maybe, remembering not to create too much suds) is poured on to the area and then the Transparent Head spotting tool is used to concentrate suction and steam to release the stain. 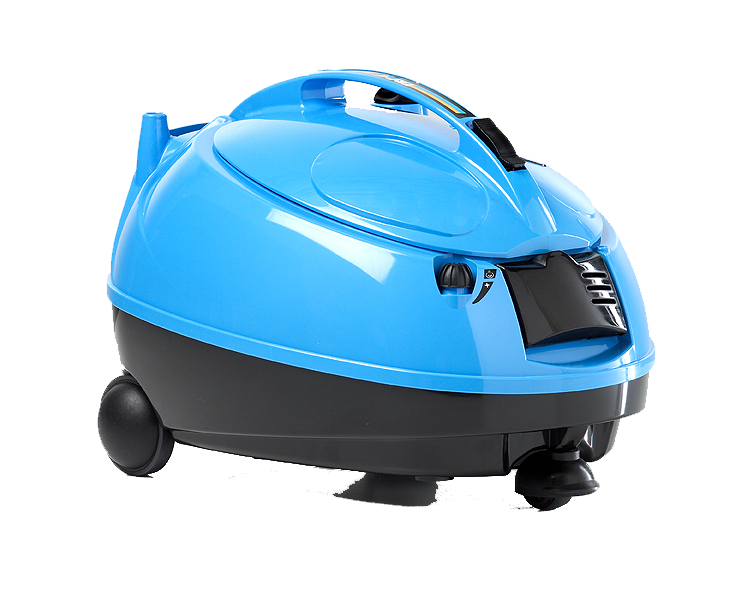 The Power Head can also be used for mattress cleaning to remove dead human skin flakes, dust mites and odours. The Filtro Vap is a revolutionary dual filtration system process. Vacuumed air and dust particles first pass through a 102°C steam chamber to dampen and kill organisms before entering into the water filtration/collection chamber. Air is then expelled from the QV7 at 99. 99% filtration. This filtration system extracts the smallest particles such as pollen, mites, and micro dust which are among the main causes of respiratory ailments. The added steam filtration offered with the QV7 is ideal for asthma and allergy sufferers. As an option you can also insert fragrances into the collection chamber and disperse a fresh aroma into the atmosphere as you clean. Homeowners who want a dual steam with vacuum cleaner designed to protect and maintain fine/quality carpets. Allergy or Asthma suffers also purchase the QV7 as the filtration system significantly reduces dust emissions when dry vacuuming.